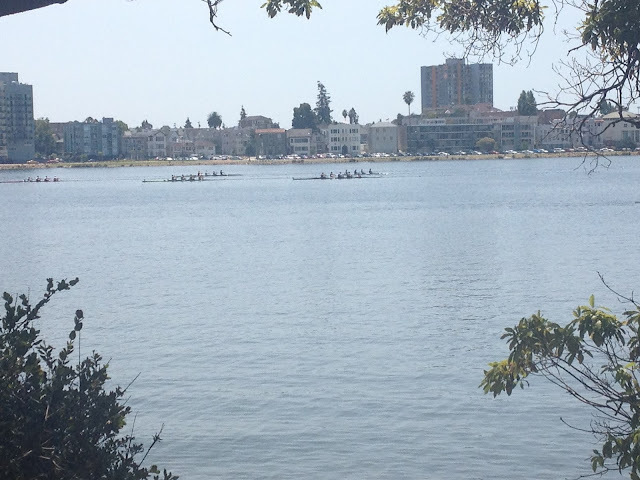 about two weeks ago i went to a regatta. . .
how classy, you say, well why yes it was. well i mean we sat on the grass and ate cookies. but that can be classy....right??? it was held at Lake Merritt. which is this amazing lake (as you can see in the picture below). it is right smack dab in the center of Oakland. the whole reason for attending the regatta was to cheer on tricia's dad. so you just cheer for everyone! now you see i have always been fascinated by rowing. enough to compete in the olympics. yep these are the things i think about. so i have decided one i get settled after graduation i am going to start rowing. these are my olympic dreams we are talking about.